Macaw's sexual dimorphism does not exist, so both male and female look exactly alike. 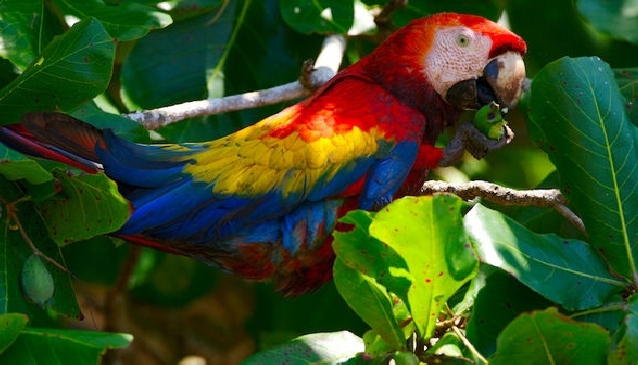 Scarlett Macaws, or “Lapas” as they are natively known, once one of the most popular natural Costa Rica attractions, are starting to return to Costa Ballena after being absent from the area for many years. This is a source of great pride for local groups such as Asana who have spent years protecting the natural environment so that jungle animals can safely inhabit Costa Rica. These colourful Macaws have made a comeback and can now be seen routinely flying along the beaches that stretch between Playa Tortuga and Playa Uvita. They have even spotted as far north as Rancho La Merced which is just north of Uvita. Belonging to the Psittacidae parrot family, the Scarlett Macaws never go unnoticed due to their distinctive bird song. Found in Central and South America, from Southern Mexico to Argentina, these unique creatures are renowned for pecking the almond trees that line the countless beaches of Costa Rica. At high risk of extinction, these beautiful birds are mostly seen as exotic trophies living in cages around the world. Local organizations hope to ensure that future generations can see them in their natural habitat, campaigning for the prevention of the illegal trafficking and sale of this species. Commonly seen flying in pairs, the Macaws species are monogamous, meaning they have only one single partner throughout their life (even if their mate dies)! Macaw's sexual dimorphism does not exist, so both male and female look exactly alike. Laying one or two eggs at a time, the Macaws search for a few natural hollows in the trees so that they can tend to their young. They hatch the eggs for as long as 25 days and then care for the chicks for the first 105 days of their life. At the age of one, offspring separate from their parents and will wait another 3 years until they start looking for a partner to share their 30 to 40 year-long life with. Loved Fernando's account on wildlife in Costa Rica? You might find the following useful!